“An apple a day keeps the doctor away” is an old maxim I learned growing up as a child. It must have unconsciously influenced me as I have been following this regime all my life. I am still hoping that the flavonoid quercetin they contain is helping to keep my brain active. Presently enjoying the brand new crop of apples. 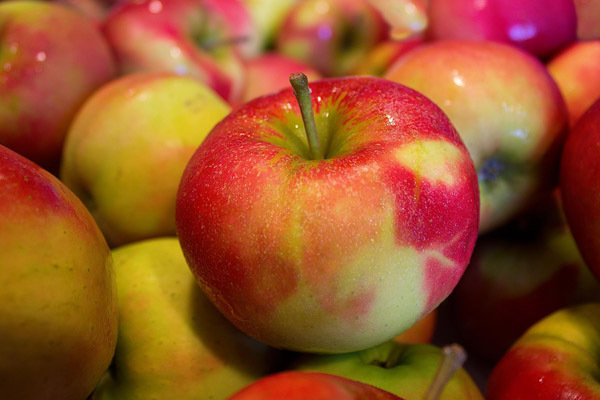 Few foods offer the wonderful sensation of biting into a crisp sweet juicy apple! So many varieties to choose from for various uses as set out in www.theyummylife.com/files/Comparing_Apples_to_Apples.pdf Their list doesn’t include Cox’s Orange Pippin, Spartan, Sunrise, and others such as the newest commercial variety Okana. I like the way Golden Delicious hold their shape in apple pie. For eating raw they list 11 different varieties as highly recommended. Gala “mild, sweet, crisp” is my usual go to but I also like fresh Ambrosia. Fun time to experiment and determine which type of apple is your fav. Please vote on your personal choice.